Ventures, such as our walk to the water, do not come around all too often in one’s life, so Jake and I deemed it patent to make the most of our trip. With this enlightened state of mind we decided, amongst other things, to raise money for a charity, using our walk as the driving incentive for donations. With little deliberation we chose WaterAid, an international charity working to improve global access to safe water and sanitation, or, as a certain Bristol based newspaper put it, ‘WaterAid, a water safety charity’. Well, they can’t get it perfect every time. The picture shows a stand that Jake erected in The Bristol Aquarium, where he currently works. 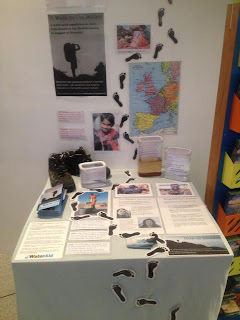 The stand, and its wealth of WaterAid facts and figures, depicts the effectiveness of small contributions on improving millions of lives around the world. With the help of the stand, a couple of press releases and our fundraising page (www.justgiving.com/awalktothewater) we have already raised almost £1,250. This is wonderful, but we want it to be more. Thus, with the desired risk of sounding repetitive and annoying, please donate, and if you can’t donate then talk about WaterAid; raising awareness and consciousness is an undeniably productive step towards improving global access to safe water and sanitation. MP: "Mr Churchill, must you fall asleep while I'm speaking?" Churchill: "No, it's purely voluntary."